Bambusoideaes are composed of 75 genera and about 1, 250 species of bamboos distributed in a range of environments from tropical and warm ecosystems to cold regions [1Chaomao H, Weiyi L, Xiong Y, Yuming Y. Bamboo for the environment and trade: Environmental Benefits of Bamboo Forests and the Sustainable Development of Bamboo Industry in Western China 2006.]. On the basis of morphological habit, Bambusoideaes are classified as woody and herbaceous bamboos [2Ramanayake SM, Meemaduma VN, Weerawardene TE. Genetic diversity and relationships between nine species of bamboo in Sri Lanka, using random amplified polymorphic DNA. Plant Syst Evol 2007; 269(1-2): 55-61. [http://dx.doi.org/10.1007/s00606-007-0587-1] ]. Woody bamboos are known by their lignified culms, specialized culm leaves, bisexual flowers, outer ligules on the foliage leaves, complex vegetative branching and gregarious monocarpy [3BPG. Bamboo Phylogeny Group. An updated tribal and sub-tribal classification for the Bambusoideae (Poaceae). Procof the 9th World Bamboo Congress Gielis J, Potters G, Eds. Antwerp, Belgium. 2012; pp. In: World Bamboo Organization; 2012; 3-27.]. Herbaceous bamboos are known by short and more frailly lignified shoots, smaller branches, unisexual flowers, cyclic flowering pattern [3BPG. Bamboo Phylogeny Group. An updated tribal and sub-tribal classification for the Bambusoideae (Poaceae). Procof the 9th World Bamboo Congress Gielis J, Potters G, Eds. Antwerp, Belgium. 2012; pp. In: World Bamboo Organization; 2012; 3-27.]. Only two species of Bamboos, namely Arundinaria Alpina (K.schum) and Oxytenanthera abyssinica (A.rich) are found in Ethiopia. It is believed that 60% of African Bamboo resources are found in Ethiopia [4Yeshambel M, Mengistu U, Getachew A. The role indigenous bamboo species (Yushania alpine and Oxytenanthera abyssinia) as ruminant feed in northwestern Ethiopia. LRRD 2011; 23: 250-8.]. O. Abyssinica grows at an altitude range of 700 - 1,800 m above sea level in the western part of Ethiopia adjacent to Sudanese Savannah Woodlands. According to FAO and INBAR [5(International Network for Bamboo and Rattan) Global Forest Resource assessment Update, Ethiopia Country Report on Bamboo Resources 2005. ], the major portion of Ethiopia’s bamboo (85%) is the O. abyssinica. One of the important features is, it's a hardy species on poor soils in dry vegetation formation. It is most resistant to drought as it tolerates rainfall down to 700 mm and a high temperature of up to 43oC [6Kigomo BN, Kamiri JF. Observations on the growth and yield of Oxythenthera abussinica (A. Rich) munro in plantation. EAfriAgricForJ 1985; 51: 22-9. [http://dx.doi.org/10.1080/00128325.1985.11663456] ]. O.abyssinica has wider applications, including but not limited to housing, fodder, beehives, pulping and paper, flooring and furniture, charcoal, fiber and textile, plywood for truck carriage and molding board for concrete [7Qisheng Z, Shenxue J, Yongyu T. Industrial Utilization of Bambooo Thechnical Report No 26 International Network for Bamboo and rattan, Beijing, China 2001., 8Liese W. Bamboo plantations, The two Bamboos of Ethiopia 2008.]. O. abyssinica is clump-forming sympodial bamboo with a strong rhizome up to 10 cm in diameter grows in pure stands. The culms/stems are grouped into large dense clumps erect and leaning with a length up to10 m [6Kigomo BN, Kamiri JF. Observations on the growth and yield of Oxythenthera abussinica (A. Rich) munro in plantation. EAfriAgricForJ 1985; 51: 22-9. [http://dx.doi.org/10.1080/00128325.1985.11663456] ]. The base diameter varies from 3-5 cm. During shooting, culms are solid and later on develop into a small central cavity with a thick culm wall. Due to this, O. abyssinica is not easier to split for weaving as A. alpina. The stripped leaves are about 20 cm long and during unfavorable environmental conditions, they have deciduous foliage. There is a morphological difference as some clumps have exceptionally thinner culms and others with much taller and thicker culms among the normal sized ones. Such differences could result from cross-fertilization when flowering. It leads to a variety of seedlings with different growth characteristics of the individual clumps, quite contrary to the monopodial A. alpina [8Liese W. Bamboo plantations, The two Bamboos of Ethiopia 2008.]. Under conducive natural conditions, it grows at a density of 8000 stems/ha. The above-ground biomass is about 20 tonnes/ha [9Embaye K. Ecological aspects and resource management of bamboo forests in Ethiopia Doctoral dissertation, ISSN 1401-6230 2003.]. The basic chromosome number of herbaceous bamboos is 11 (x = 11), while the basic chromosome number of woody bamboos is believed to be 12 (x = 12.) Woody bamboos have different ploidy levels, the hexaploid (2n = 6, x = 72) tropical woody bamboos and the tetraploid (2n = 4x = 48) temperate woody bamboos [10Clark LG, Zhang W, Wendel JF. A phylogeny of the grass family (Poaceae) based on ndhF sequence data. Syst Bot 1995; 20(4): 436-60. [http://dx.doi.org/10.2307/2419803] ]. In response to serious environmental stresses, a series of plant genes with diverse functions are either repressed or enhanced [11Lata C, Prasad M. Role of DREBs in regulation of abiotic stress responses in plants. J Exp Bot 2011; 62(14): 4731-48. [http://dx.doi.org/10.1093/jxb/err210] [PMID: 21737415] -13De Domenico S, Taurino M, Gallo A, et al. Oxylipin dynamics in Medicago truncatula in response to salt and wounding stresses. Physiol Plant 2019; 165(2): 198-208. [http://dx.doi.org/10.1111/ppl.12810] [PMID: 30051613] ]. Proteins coded with stress-induced genes play a significant role during the occurrence of stresses since they are functional and regulatory proteins. Plant Transcription Factors (TFs) are regulatory proteins which control gene expression in reaction to a range of stresses including drought and salinity. Thus, TFs significantly engage in plant growth and development by regulating defense response and gene regulation networks [14Pan F, Wang Y, Liu H, et al. Genome-wide identification and expression analysis of SBP-like transcription factor genes in Moso Bamboo (Phyllostachys edulis). BMC Genomics 2017; 18(1): 486. [http://dx.doi.org/10.1186/s12864-017-3882-4] [PMID: 28655295] ]. In plants like rice [15Rabbani MA, Maruyama K, Abe H, et al. Monitoring expression profiles of rice genes under cold, drought, and high-salinity stresses and abscisic acid application using cDNA microarray and RNA gel-blot analyses. Plant Physiol 2003; 133(4): 1755-67. 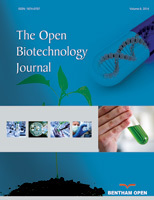 [http://dx.doi.org/10.1104/pp.103.025742] [PMID: 14645724] ], and Arabidopsis thaliana [16Seki M, Narusaka M, Ishida J, et al. Monitoring the expression profiles of 7000 Arabidopsis genes under drought, cold and high-salinity stresses using a full-length cDNA microarray. Plant J 2002; 31(3): 279-92. [http://dx.doi.org/10.1046/j.1365-313X.2002.01359.x] [PMID: 1216 4808] ], many genes have been found to be regulated in common or in particular under drought and salt stress. However, abiotic stress-induced transcriptome studies of O. abyssinica have not been undertaken. This study was conducted to unveil the most represented genes, transcript factor families and pathways of the species in response to drought and salt stresses. Quality assessment of the raw paired-end reads was performed using FastQC v0.11.2 [17Andrews S. FastQC: A quality control tool for high throughput sequence data 2010.]. Pre-processing of raw reads was conducted using Cutadapt v.1.9.1 [18Cutadapt removes adapter sequences from high-throughput sequencing reads. EMBnet Journal 2011; 17: 1-10.] for adaptor trimming and Sickle v1.33 [19Joshi NA, Fass JN. Sickle: A sliding-window, adaptive, quality-based trimming tool for FastQ fles 2011.http://www.citeulike.org /user/mvermaat/article/13260426] for quality filtering. Reads obtained after filtering were then used for transcriptome assembly using Trinity v2.2.0 [20Grabherr MG, Haas BJ, Yassour M, et al. Full-length transcriptome assembly from RNA-Seq data without a reference genome. Nat Biotechnol 2011; 29(7): 644-52. [http://dx.doi.org/10.1038/nbt.1883] [PMID: 21572440] ]. Trinity works by integrating three different software modules: Inchworm, Chrysalis, and Butterfly execute one after the other to process bulky volumes of RNA-seq reads into full-length transcripts. The duplicated contigs were removed using CD-HIT v4.5.4 [21Fu L, Niu B, Zhu Z, Wu S, Li W. CD-HIT: Accelerated for clustering the next-generation sequencing data. Bioinformatics 2012; 28(23): 3150-2. [http://dx.doi.org/10.1093/bioinformatics/bts565] [PMID: 23060610] ]. The longest transcripts were taken to be unigenes for functional annotation by identifying nucleotide sequences of all transcripts. The de novo assembled O. abyssinica unigenes were annotated through homology searches against public protein databases with an (E-value cut-off of 10-5). The unigene sequences were annotated by using Blast2go [22Götz S, García-Gómez JM, Terol J, et al. High-throughput functional annotation and data mining with the Blast2GO suite. Nucleic Acids Res 2008; 36(10): 3420-35. [http://dx.doi.org/10.1093/nar/gkn176] [PMID: 18445632] ]. The databases used for annotation include NCBI-Nr, COG, Swissprot, KEGG and GO. GO-Term Finder was used for identifying Gene Ontology (GO) terms that annotate a list of enriched genes with a significant P-value < 0.05. The GO and COG functional classification analyses of all unigenes provide valuable information in predicting possible gene functions and in determining the gene function distribution of O. abyssinica unigenes. The KEGG database which deals with genomes, biological pathways, and chemical substances was used to investigate the gene product during plant metabolism and associated gene functions in cellular processes [23Kanehisa M, Goto S. KEGG: Kyoto encyclopedia of genes and genomes. Nucleic Acids Res 2000; 28(1): 27-30. [http://dx.doi.org/10.1093/nar/28.1.27] [PMID: 10592173] ]. For expression analysis, the unigene sequence file as a reference gene file, RSEM v1.2.6 [24Li B, Dewey CN. RSEM: Accurate transcript quantification from RNA-Seq data with or without a reference genome. BMC Bioinformatics 2011; 12: 323. [http://dx.doi.org/10.1186/1471-2105-12-323] [PMID: 21816040] ] was employed to guesstimate gene and isoform expression levels from the pair-end clean data. FPKM (Fragment per Kilobases per Million reads) was calculated and employed to quantify the expression abundance of transcripts in each sample. For differential expression analysis, the DESeq2 v1.6.3 [25Anders S, Huber W. Differential expression of RNA-Seq data at the gene level–the DESeq package 2012 Sep 12; ] R program, a model based on the negative binomial distribution was used for determining differential expression from digital gene expression data. A DESeq2 analysis was performed using three combinations: (i) control vs. drought, (ii) control vs. salt and (iii) drought vs. salt. To control the false discovery rate, P-value was adjusted by Benjamini and Yekutieli’s approach [26Benjamini Y, Yekutieli D. The control of the false discovery rate in multiple testing under dependency. Ann Stat 2001; 29: 1165-88.]. Genes with |log2 Fold change| > 1 and adjusted P-value < 0.05 were treated as differentially expressed. To confirm RNA-Seq data by RT-qPCR 40 candidate, unigenes (20 up-regulated and 20 down-regulated) were randomly selected. After removing conserved regions using Expasy (https://www.expasy.org) from the protein sequences, 48 qPCR primers were designed from the full-length cDNA sequences of each unigene using Primer quest tool (supplementary file 1). Total RNA was extracted using TaKaRa MiniVEST Plant RNA Extraction Kit (Takara, Dalian, China). The quality and quantity of total RNA were checked by 1% agarose gel electrophoresis and NanoDrop 2000c Spectrophotometer (NanoDrop Technologies, Wilmington, DE, USA). The RT-qPCR was performed on an ABI 7500 real-time PCR system (Applied Biosystems, Foster City, CA, USA) using the SYBR Premix Ex Taq™ kit (Takara, Dalian, China), according to the manufacturer’s instructions. The amplification protocol comprised a 5-minute incubation at 94 °C then a cycle of 94 °C for 30 s, 60 °C for the 30s, 72 °C for 1 min, repeat 35 times, 72 °C for 10 min, and a final 4 °C hold. Relative expression of RT-qPCR was calculated 2-ΔΔCT.NTB- FTCTTGTTTGA CACCGAAGAGGAG and NTB-R AATAGCTGTCCCT GGAGGAGTTT primers from ERF76 gene that was confirmed to be used as references for qRT-PCR from Moso bamboo [27Fan C, Ma J, Guo Q, Li X, Wang H, Lu M. Selection of reference genes for quantitative real-time PCR in bamboo (Phyllostachys edulis). PLoS One 2013; 8(2): e56573. [http://dx.doi.org/10.1371/journal.pone.0056573] [PMID: 23437174] ]. The result of Illumina paired-end sequencing and de novo assembly of O. abyssinica is presented in Table 1 and the length distribution of 406,181 unigenes is illustrated in Fig. (1 ). From the total 406,181 identified unigenes 217,067 (53.4%) were successfully annotated using BLASTX searches against the public databases of NCBI-Nr (203,777, 93.8%), Swissprot (115,741, 53.3%), COG (81,632, 37.6%) and KEGG (80,587, 37%). But the remaining 189,114 (46.6%) unigenes did not show any significant functional similarity to any of the database explored. The detailed distribution of annotated unigenes to each and multiple databases is shown in Fig. (2 ). The most over-represented GO terms in response to drought and salt stresses were “binding, 48,000 unigenes”, “catalytic activity, 39,000 unigenes” both under molecular function category. 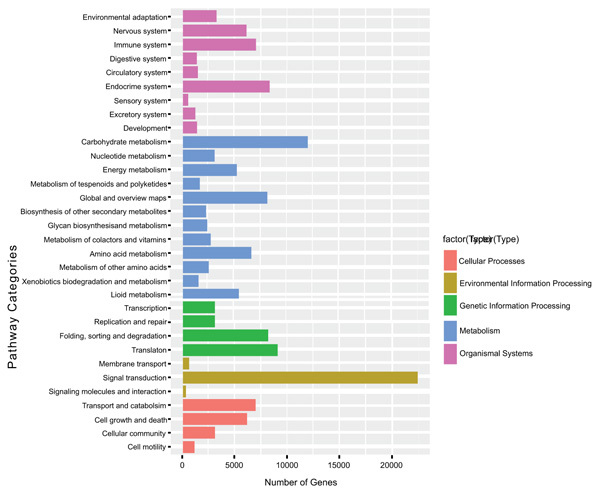 “Cell part, 30,000 unigene”, “organelle 28,000 unigenes” from Cellular component and “Metabolic processes 30,000 unigene”, “cellular process 28,000 unigenes” from the biological process was also represented with a significant amount of unigenes (Fig. 3 ). To understand the biological functions of the transcriptome genes on the biochemical pathways KEGG functional classification was performed and obtained 80,587 (19.8%) unigenes involved into 32 KEGG pathway categories. Among the KEGG pathways categories, signal transduction is the most represented with 25,000 genes (31%) followed by carbohydrate metabolism 12,000 genes (14.9%). The other pathway categories with a significant number of unigenes include Endocrine system, global and overview maps, translation, folding, sorting, and degradation pathway categories. These pathways have genes ranging from 8,000 to 9,000 genes (Fig. 4 ). Summary of Illumina paired-end sequencing and de novo assembly of O. abyssinica. Unigene length distribution of O. abyssinica transcriptome. Venn diagram showing annotation of unigenes. COG functional classifications of Oxytenanthera abyssinica transcripts. Gene ontology classification, the vertical axis is the enriched GO terms and the horizontal axis is the number of differential expressed genes in each term. Different colors are used to distinguish between biological processes, cellular components, and molecular functions. Transcript factors have been exhibited to engage in key tasks in reaction to abiotic stresses by regulating gene expression [28Nuruzzaman M, Sharoni AM, Kikuchi S. Roles of NAC transcription factors in the regulation of biotic and abiotic stress responses in plants. Front Microbiol 2013; 4: 248. [http://dx.doi.org/10.3389/fmicb.2013.00248] [PMID: 24058359] , 29Nakashima K, Yamaguchi-Shinozaki K, Shinozaki K. The transcriptional regulatory network in the drought response and its crosstalk in abiotic stress responses including drought, cold, and heat. Front Plant Sci 2014; 5: 170. [http://dx.doi.org/10.3389/fpls.2014.00170] [PMID: 24904597] ]. For a comprehensive understanding of O. abyssinica’s gene control and regulation, transcript factors were predicted using family assignment rules established at http://itak.feilab.net/cgi-bin/itak/online_itak.cgi [30Zheng Y, Jiao C, Sun H, et al. iTAK: A program for genome-wide prediction and classification of plant transcription factors, transcriptional regulators, and protein kinases. Mol Plant 2016; 9(12): 1667-70. [http://dx.doi.org/10.1016/j.molp.2016.09.014] [PMID: 27717919] ]. According to family assignment rules 4,332 Transcript Factors (TFs) were predicted to have active involvement in the regulations of gene expression and these TFs were organized into 64 transcription factors protein families. 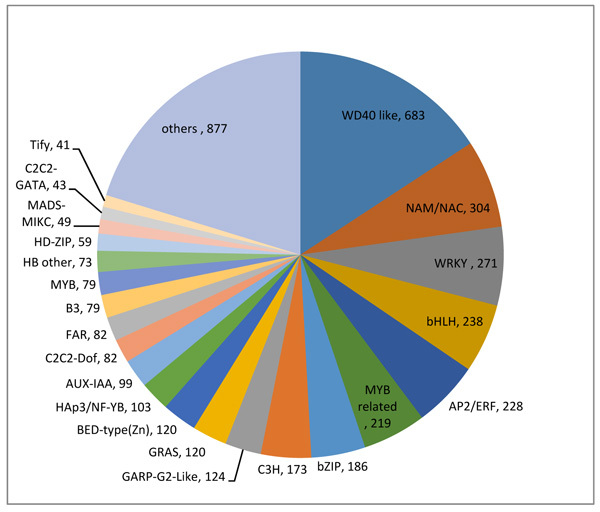 WD40, NAM/NAC, WRKY, bHLH, AP2/ERF, MYB relate and bZIP, were the most dominant TFs families (Fig. 5 ). These sequences specific DNA-binding proteins are believed to take part in a decisive role in stress signal transduction pathways. TFs families with proven roles in the regulation of stress response in plants include, NAC, WRKY, AP2/ERF, bZIP, and MYB related [31Naika M, Shameer K, Mathew OK, Gowda R, Sowdhamini R. STIFDB2: an updated version of plant stress-responsive transcription factor database with additional stress signals, stress-responsive transcription factor binding sites and stress-responsive genes in Arabidopsis and rice. Plant Cell Physiol 2013; 54(2): e8. [http://dx.doi.org/10.1093/pcp/pcs185] [PMID: 23314754] ]. In this study the most represented TF families with differentially expressed genes (DEGs) includes, bZIP (49), WRKY (43), MYB (38), AP2/ERF (30), HD-ZIP (25) and MYB related (21), which demonstrates members of these gene families are closely associated with abiotic stress defense [32Deinlein U, Stephan AB, Horie T, Luo W, Xu G, Schroeder JI. Plant salt-tolerance mechanisms. Trends Plant Sci 2014; 19(6): 371-9. [http://dx.doi.org/10.1016/j.tplants.2014.02.001] [PMID: 24630845] , 33Zhao H, Lou Y, Sun H, et al. Transcriptome and comparative gene expression analysis of Phyllostachys edulis in response to high light. BMC Plant Biol 2016; 16: 34. [http://dx.doi.org/10.1186/s12870-016-0720-9] [PMID: 26822690] ]. The direct expression of a gene's expression level is the abundance of its transcript, the higher the degree of transcript abundance, the higher the gene expression level. 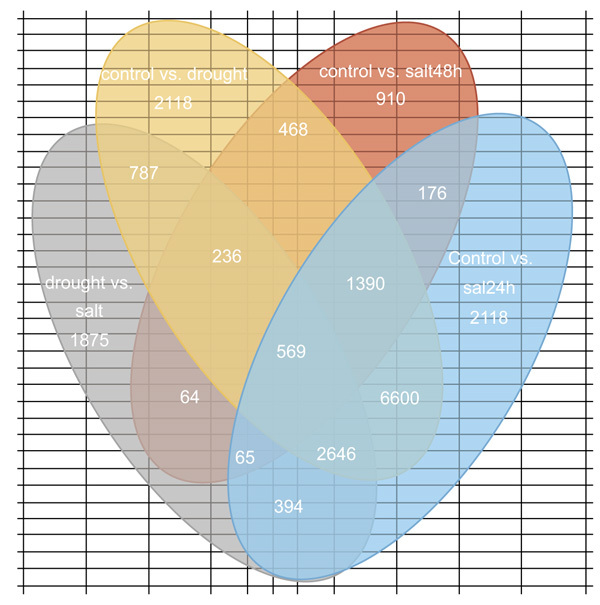 DEGs analysis used three combinations: (i) Control vs. drought, (ii) control vs. salt and (iii) drought vs. salt. The number of DEGs common and specific between the different stresses were presented in Fig. (6 ). Clustering analysis was conducted to: (i) calculate the similarity of the data and classify the data according to the similarity so as to cluster together the genes with the same function or close relationship, (ii) to identify the unknown gene function or the unknown function of the known gene and (iii) to infer whether they commonly participate in the same metabolic process or cell pathways. KEGG classifications, the vertical axis for biological pathways for the six categories; the horizontal line for the number of genes; different colors used to distinguish the biological pathway of a classification. The most abundant predicted transcription factor families. 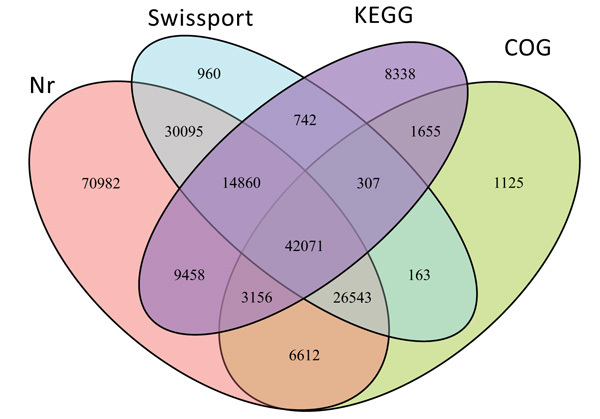 Venn diagrams showing the number of unique DEGs in each pair of samples, as well as the number of shared DEGs. Treatment groups stand for N1-3 vs. P1-3(drought vs. salt), W1-3 vs. P1-3(control vs. drought), W4-6 vs. N4-6 (control vs. salt 48 h) and W1-3 vs. N1-3(Control vs. salt 24 h). The average length of 641 bp, N50 of 873 bp was more or less comparable with other de novo transcriptome assemblies in other plant species [34Liu M, Qiao G, Jiang J, et al. Transcriptome sequencing and de novo analysis for Ma bamboo (Dendrocalamus latiflorus Munro) using the Illumina platform. PLoS One 2012; 7(10): e46766. [http://dx.doi.org/10.1371/journal.pone.0046766] [PMID: 23056442] -38Salgado LR, Lima R, dos Santos BF, et al. De novo RNA sequencing and analysis of the transcriptome of signalgrass (Urochloa decumbens) roots exposed to aluminum. Plant Growth Regulation 2017; 1; 83(1): 157-70.]. The higher ploidy level (hexaploid) nature of O. abyssinica might be the reason behind 406,181 unigenes. On the contrary de novo assembled hexaploid hulless Oat has generated 128,414 putative unigenes [39Wu Q, Bai X, Zhao W, et al. De novo assembly and analysis of tartary buckwheat (Fagopyrum tataricum Garetn.) transcriptome discloses key regulators involved in salt-stress response. Genes (Basel) 2017; 8(10): 255. [http://dx.doi.org/10.3390/genes8100255] [PMID: 28972562] ], transcriptome analysis of five hexaploid and allododecaploid Spartina species generated unigenes ranging from 13,054 to 16,002 [40Boutte J, Ferreira de Carvalho J, Rousseau-Gueutin M, et al. Reference transcriptomes and detection of duplicated copies in hexaploid and Allododecaploid spartina species. Genome Biol Evol 2016; 8(9): 3030-44. [http://dx.doi.org/10.1093/gbe/evw209] [PMID: 27614235] ]. In the species similarity search, O. abyssinica showed less similarity with Moso bamboo. This genetic divergence might be due to the existences of more than 1,250 species of bamboos across the globe, differences in speciation time, variation in selection pressure and geographic distances. When compared to transcriptome analysis of other plants, the 217,067 number of functionally annotated unigenes of O. abyssinica were much higher. 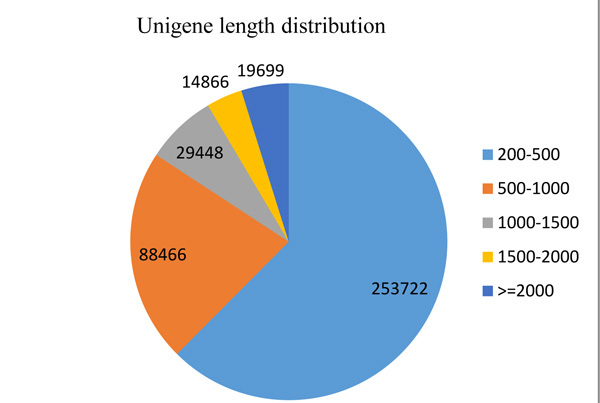 Although the number is higher, the percentage of annotated unigenes is smaller (53.4%). For instance, the number of unigenes and annotated percentage of some species includes, 59,814 unigenes (73%) in drought and cold stresses response of Ammopiptanthus mongolicus, 177, 817 unigenes (94.8%) in salt response of Spartina alterniflora, 54,125 unigenes (58.7%) in desiccation-tolerant moss Syntrichia caninervis, 95,897 unigenes (83.57%) in Miscanthus sinensis [34Liu M, Qiao G, Jiang J, et al. Transcriptome sequencing and de novo analysis for Ma bamboo (Dendrocalamus latiflorus Munro) using the Illumina platform. PLoS One 2012; 7(10): e46766. [http://dx.doi.org/10.1371/journal.pone.0046766] [PMID: 23056442] , 35Wu Y, Wei W, Pang X, et al. Comparative transcriptome profiling of a desert evergreen shrub, Ammopiptanthus mongolicus, in response to drought and cold stresses. BMC Genomics 2014; 15(1): 671. [http://dx.doi.org/10.1186/1471-2164-15-671] [PMID: 25108399] , 41Gao B, Zhang D, Li X, Yang H, Wood AJ. De novo assembly and characterization of the transcriptome in the desiccation-tolerant moss Syntrichia caninervis. BMC Res Notes 2014; 7: 490. [http://dx.doi.org/10.1186/1756-0500-7-490] [PMID: 25086984] , 42Bedre R, Mangu VR, Srivastava S, Sanchez LE, Baisakh N. Transcriptome analysis of smooth cordgrass (Spartina alterniflora Loisel), a monocot halophyte, reveals candidate genes involved in its adaptation to salinity. BMC Genomics 2016; 17(1): 657. [http://dx.doi.org/10.1186/s12864-016-3017-3] [PMID: 27542721] ]. In O. abyssinica, of the total 406,181 unigenes, 217,067 unigenes were functionally annotated. The remaining 189,114 (46.6%) unigenes did not show any significant functional similarity to any of the database explored. This may be attributed to the lack of references genome of O. abyssinica and the highly divergent nature of the unigenes or novel genes that carry out species-specific functions. The GO analysis revealed that binding and catalytic activity from molecular function and metabolic process from the cellular component were represented with a high number of unigenes. More or less similar supporting results were found in transcriptome analysis of Ammopiptanthus mongolicus, Nitraria sibirica and Urochloa decumbens under abiotic stresses [35Wu Y, Wei W, Pang X, et al. Comparative transcriptome profiling of a desert evergreen shrub, Ammopiptanthus mongolicus, in response to drought and cold stresses. BMC Genomics 2014; 15(1): 671. [http://dx.doi.org/10.1186/1471-2164-15-671] [PMID: 25108399] , 36Li LQ, Li J, Chen Y, Lu YF, Lu LM. De novo transcriptome analysis of tobacco seedlings and identification of the early response gene network under low-potassium stress. Genet Mol Res 2016; 15(3): 15038599. [http://dx.doi.org/10.4238/gmr.15038599] [PMID: 27706558] , 38Salgado LR, Lima R, dos Santos BF, et al. De novo RNA sequencing and analysis of the transcriptome of signalgrass (Urochloa decumbens) roots exposed to aluminum. Plant Growth Regulation 2017; 1; 83(1): 157-70. ], this suggests that genes involved in the above GO terms are responsive to abiotic stress. Only 20% of unigenes were assigned to COG database and the majority of these unigenes goes to cellular processing and signaling pathway categories. These two dominant subcategories were also with the highest unigenes in a transcriptome analysis of Moss, Tall Fescue and Tobacco [41Gao B, Zhang D, Li X, Yang H, Wood AJ. De novo assembly and characterization of the transcriptome in the desiccation-tolerant moss Syntrichia caninervis. BMC Res Notes 2014; 7: 490. [http://dx.doi.org/10.1186/1756-0500-7-490] [PMID: 25086984] , 43Talukder SK, Azhaguvel P, Mukherjee S, et al. De novo assembly and characterization of tall fescue transcriptome under water stress. Plant Genome 2015. [http://dx.doi.org/10.3835/plantgenome2014.09.0050] , 44Li LQ, Li J, Chen Y, Lu YF, Lu LM. De novo transcriptome analysis of tobacco seedlings and identification of the early response gene network under low-potassium stress. Genet Mol Res 2016; 15(3): 15. [http://dx.doi.org/10.4238/gmr.15038599] [PMID: 27706558] ]. This suggests large numbers of genes in cellular processing and signaling are actively involved in drought and salt stresses response. Functionally unclassified 4933 unigenes might stand for lineage and/or species-specific genes for adoptive innovation and could be untranslated regions of the transcriptome or novel genes that perform species-specific functions. Signal transduction mechanism at COG and signal transduction at KEGG analysis are represented by the highest numbers of genes, which suggests that both the genes involved and the functional pathways actively respond to stress [35Wu Y, Wei W, Pang X, et al. Comparative transcriptome profiling of a desert evergreen shrub, Ammopiptanthus mongolicus, in response to drought and cold stresses. BMC Genomics 2014; 15(1): 671. [http://dx.doi.org/10.1186/1471-2164-15-671] [PMID: 25108399] ]. The metabolic pathways analysis result suggests that signal transduction and carbohydrate metabolism events are active in O. abyssinica response in the face of drought and salt stress. Similar supporting results were obtained from Cotton and Buckwheat transcriptome analysis under abiotic stress [39Wu Q, Bai X, Zhao W, et al. De novo assembly and analysis of tartary buckwheat (Fagopyrum tataricum Garetn.) transcriptome discloses key regulators involved in salt-stress response. Genes (Basel) 2017; 8(10): 255. [http://dx.doi.org/10.3390/genes8100255] [PMID: 28972562] , 45Zhu YN, Shi DQ, Ruan MB, et al. Transcriptome analysis reveals crosstalk of responsive genes to multiple abiotic stresses in cotton (Gossypium hirsutum L.). PLoS One 2013; 8(11): e80218. [http://dx.doi.org/10.1371/journal.pone.0080218] [PMID: 24224045] ]. TF families showing up-regulation for both stresses could be targets for studying plant response in the face of unfavorable environmental conditions. Whole genome expression profiling and transcriptome studies in many plants have confirmed the stress responsiveness of various TF families, C2H2 in Populus trichocarpa [46Liu Q, Wang Z, Xu X, Zhang H, Li C. Genome-wide analysis of C2H2 zinc-finger family transcription factors and their responses to abiotic stresses in poplar (Populus trichocarpa). PLoS One 2015; 10(8): e0134753. [http://dx.doi.org/10.1371/journal.pone.0134753] [PMID: 26237514] ], NAC in Soybean [47Le DT, Nishiyama R, Watanabe Y, et al. Genome-wide survey and expression analysis of the plant-specific NAC transcription factor family in soybean during development and dehydration stress. DNA Res 2011; 18(4): 263-76. [http://dx.doi.org/10.1093/dnares/dsr015] [PMID: 21685489] ], WD40 in Foxtail Millet [48Mishra AK, Muthamilarasan M, Khan Y, Parida SK, Prasad M. Genome-wide investigation and expression analyses of WD40 protein family in the model plant foxtail millet (Setaria italica L.). PLoS One 2014; 9(1): e86852. [http://dx.doi.org/10.1371/journal.pone.0086852] [PMID: 24466268] ], WRKY in carrot [44Li LQ, Li J, Chen Y, Lu YF, Lu LM. De novo transcriptome analysis of tobacco seedlings and identification of the early response gene network under low-potassium stress. Genet Mol Res 2016; 15(3): 15. [http://dx.doi.org/10.4238/gmr.15038599] [PMID: 27706558] ] and Broomcorn millet [49Yue H, Wang M, Liu S, Du X, Song W, Nie X. Transcriptome-wide identification and expression profiles of the WRKY transcription factor family in Broomcorn millet (Panicum miliaceum L.). BMC Genomics 2016; 10(17): 343.2016; ]. In addition to wild plants, many studies have been conducted on the role of TF families in stress response of transgenic plants, like AP2/ERF conferred stress tolerances in Populus simonii x populous nigra [50Yao W, Zhang X, Zhou B, Zhao K, Li R, Jiang T. Expression pattern of ERF gene family under multiple abiotic stresses in Populus simonii × P. nigra. Front Plant Sci 2017; 8: 181. [http://dx.doi.org/10.3389/fpls.2017.00181] [PMID: 28265277] ], manipulation of specific NAC TFs has conferred stress tolerance in transgenic Rice, Tobacco, Wheat and Arabidopsis [51Shao H, Wang H, Tang X. NAC transcription factors in plant multiple abiotic stress responses: progress and prospects. Front Plant Sci 2015; 6: 902. [http://dx.doi.org/10.3389/fpls.2015.00902] [PMID: 26579152] ], AP2/ERF in transgenic Trifolium alexandrinum [50Yao W, Zhang X, Zhou B, Zhao K, Li R, Jiang T. Expression pattern of ERF gene family under multiple abiotic stresses in Populus simonii × P. nigra. Front Plant Sci 2017; 8: 181. [http://dx.doi.org/10.3389/fpls.2017.00181] [PMID: 28265277] ], bHLH in Arabidopsis thailina [52Abogadallah GM, Nada RM, Malinowski R, Quick P. Overexpression of HARDY, an AP2/ERF gene from Arabidopsis, improves drought and salt tolerance by reducing transpiration and sodium uptake in transgenic Trifolium alexandrinum L. Planta 2011; 233(6): 1265-76. [http://dx.doi.org/10.1007/s00425-011-1382-3] [PMID: 21340699] , 53Babitha KC, Ramu SV, Pruthvi V, Mahesh P, Nataraja KN, Udayakumar M. Co-expression of AtbHLH17 and AtWRKY28 confers resistance to abiotic stress in Arabidopsis. Transgenic Res 2013; 22(2): 327-41. [http://dx.doi.org/10.1007/s11248-012-9645-8] [PMID: 22948308] ]. The involvements of TF families in diverse abiotic stresses have been reported in different plants [54Wani SH, Singh NB, Devi TR, Haribhushan A, Jeberson SM. Engineering abiotic stress tolerance in plants: Extricating regulatory gene complex. Conventional and Non-Conventional Interventions in Crop Improvement 2013.-56Wang H, Wang H, Shao H, Tang X. Recent advances in utilizing transcription factors to improve plant abiotic stress tolerance by transgenic technology. Front Plant Sci 2016; 7: 67. [PMID: 26904044] ]. Analysis of differentially expressed genes has revealed abiotic stress responsiveness of O. abyssinica genome. A total of 65,471 DEGs from these 29,746 up-regulated and 35, 725 were down-regulated. DEGs analysis of hexaploid hulless oat has generated 65,000 unigenes [39Wu Q, Bai X, Zhao W, et al. De novo assembly and analysis of tartary buckwheat (Fagopyrum tataricum Garetn.) transcriptome discloses key regulators involved in salt-stress response. Genes (Basel) 2017; 8(10): 255. [http://dx.doi.org/10.3390/genes8100255] [PMID: 28972562] ]. The functionally annotated 14,258 genes proved to be actively involved in diverse pathways activities. As many genes involved in similar functions, the most represented proteins by up-regulated genes include, heat shock 70kDa protein 1/8, serine/threonine-protein kinase SRK2, protein phosphatase 2C, beta-glucosidase, glutathione S-transferase protein xylosyltransferase, GTP-binding nuclear protein Ran, CTP synthase, adenylate kinase, Delta 1-pyrroline-5-carboxylate Synthetase, glutamine synthetase, Chitinase and glyceraldehyde-3-phosphate dehydrogenase. Majority of the above proteins take part in an important role in the regulation of stress tolerance. Serine-threonine protein kinases are proven to take part in the regulation of signaling cascades and some of these when over-expressed improved stress-tolerance of plants [57Mao X, Zhang H, Tian S, Chang X, Jing R. TaSnRK2.4, an SNF1-type serine/threonine protein kinase of wheat (Triticum aestivum L.), confers enhanced multistress tolerance in Arabidopsis. J Exp Bot 2010; 61(3): 683-96. [http://dx.doi.org/10.1093/jxb/erp331] [PMID: 20022921] ]. Glutamine synthetase involves incorporating toxic free ammonium ions into glutamate and glutamine, respectively; thus up-regulation of these genes may be a possible mechanism of stress tolerance [58Skopelitis DS, Paranychianakis NV, Paschalidis KA, et al. Abiotic stress generates ROS that signal expression of anionic glutamate dehydrogenases to form glutamate for proline synthesis in tobacco and grapevine. The Plant Cell 2006; 18(10): 2767-81. [http://dx.doi.org/10.1105/tpc.105.038323] ]. Largely represented up-regulated genes like Delta 1-pyrroline-5-carboxylate Synthetase, glyceraldehyde-3-phosphate dehydrogenase and Chitinase play important role in plant defense and enhance resistance and tolerance to drought and salt stresses [35Wu Y, Wei W, Pang X, et al. Comparative transcriptome profiling of a desert evergreen shrub, Ammopiptanthus mongolicus, in response to drought and cold stresses. BMC Genomics 2014; 15(1): 671. [http://dx.doi.org/10.1186/1471-2164-15-671] [PMID: 25108399] , 59Magrane M, Consortium U. UniProt Knowledgebase: A hub for protein information. Nucleic Acids Res 2015; 43: 204-12. [doi: 10.1093/nar/gku989]. [http://dx.doi.org/10.1093/nar/gku989] ]. Among the down-regulated genes, with a significant role in stress tolerances were GABA transporter, arginine, which is one of the precursors of putrescine, glutamate which is the precursor molecule for proline (an osmo-protectant) plays important role in plant stress-regulation and stress-tolerance [60Shi H, Chan Z. Improvement of plant abiotic stress tolerance through modulation of the polyamine pathway. J Integr Plant Biol 2014; 56(2): 114-21. [http://dx.doi.org/10.1111/jipb.12128] [PMID: 24401132] ]. Phosphatase 2C family protein also played a significant role in stress tolerance [61Lee YP, Giorgi FM, Lohse M, et al. Transcriptome sequencing and microarray design for functional genomics in the extremophile Arabidopsis relative Thellungiella salsuginea (Eutrema salsugineum). BMC Genomics 2013; 14: 793. [http://dx.doi.org/10.1186/1471-2164-14-793] [PMID: 24228715] ]. Receptor protein kinase-like and Glucose-6-phosphate dehydrogenase are also believed to confer stress tolerances in Barley dehydration shock and drought stress [62Talamè V, Ozturk NZ, Bohnert HJ, Tuberosa R. Barley transcript profiles under dehydration shock and drought stress treatments: A comparative analysis. J Exp Bot 2007; 58(2): 229-40. [http://dx.doi.org/10.1093/jxb/erl163] [PMID: 17110587] ].